This time I’m going to be quick. Which dress should I wear? 3 hours later…. Blue or violet? Dresses are always a pain for a woman. From the moment they are thinking of purchasing them until the time they need to pick the perfect one from the wardrobe which matches the shoes for the special occasion (that is the birthday party of the long distance cousin you haven’t seen the last decade). It can be an even bigger pain to fit in a dress which you wore 15 years ago in the high school prom but the problem is that you are now a bit heavier. Like 80 pounds heavier. We found 15 of the most unusual dresses which can make you stand out and steal everybody’s thunder. Have a look at them and give us your verdict. 1. Dress made out of porcelain. Just in case you wish to go out with your friend for a cup of tea. 7. If you can’t get enough of your beautiful flowers, you can take them with you 8. Going out with Captain Kirk? 9. 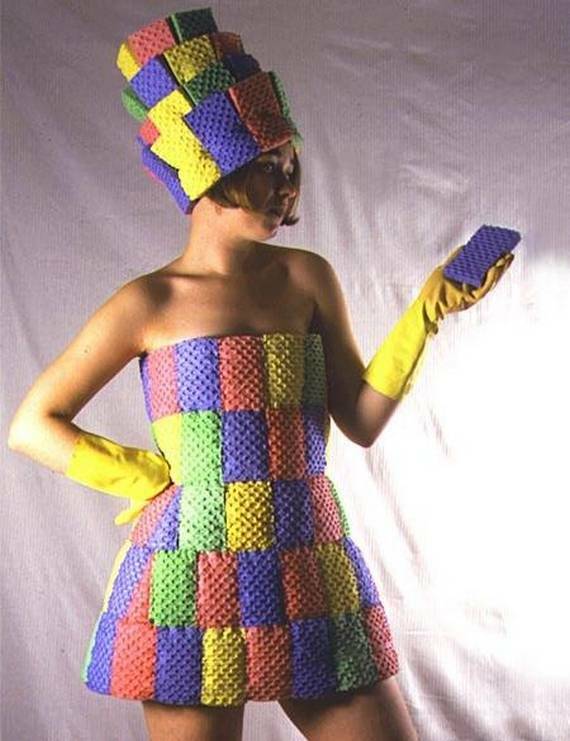 A dress made out of hundreds of sponges with household cleaning in mind. 10. You don’t have to undress anymore. You can just eat your way out of your dress with the cake dress. 11. That’s Lady Gaga and that’s a dress full of meat. 13. Lady Gaga again, this time with a wig dress. You might think that she is even wearing her dress on her head. Or the other way around.